Aspire Tigon 5pk CoilsTwo types of push fit replacement coils for the Tigon Kit from Aspire. A 0.4 o.. Aspire Cleito 120 Pro TankAspire is proud to announce the latest addition to the Cleito Tank Family,.. Aspire Breeze 2 Pod (0.6Ω Coil Pre-Installed)The Breeze 2 Pod for the Breeze 2 Kit from Aspire comes.. Aspire Spryte AIO Pod (1.8Ω Coil Pre-Installed)The Spryte Pod by Aspire for the Spryte AIO Pod Kit i.. Aspire Cleito MESH 5pk CoilsThe Cleito Mesh 0.15 Ohm Coils by Aspire are excellent for vapor product.. Aspire Cleito PRO 5pk CoilsBoth Cleito PRO coils are excellent for vapor production and compatible w.. Aspire Cleito PRO TankAspire is proud to announce the latest addition to the Cleito series, int.. Aspire Spryte BVC Replacement 5pk CoilsThe Aspire Spryte atomizer is the well known and trusted BVC .. Aspire Spryte AIO Starter KitAnother great AIO pod system from Aspire, the Spryte AIO. An all new de.. Aspire Breeze Special Edition KitIntroducing the all new Aspire Breeze in new Special Edition colors.. Aspire Breeze 2 KitThe ever popular all in one device from Aspire, the Breeze, has been redesigned w.. Aspire BVC ET-S Clearomizer (Single)The ET-S BVC is an upgraded version of ET BDC, it has an exterio.. Aspire Revvo TankIntroducing the all new Aspire Revvo tank, a truly 'out of this world' design with .. Aspire ARC Revvo Coil 3 Pack.. Aspire Typhon Revvo KitIntroducing a new addition to our kit range, the Aspire Typhon 100 Revvo Kit .. Aspire Skystar Revvo Kit with The New Revolutionary CoilAspire brings you yet another great new mod .. Aspire K1 BVC GlassomizerThe K1 is a new generation of glassomizer, which uses the Aspire BVC (Botto.. Aspire Cleito 120 Tank Extended Replacement Glass1 x Cleito 120 Extended Replacement Glass Tube.. Aspire Athos Single Unit Coils ***SOLD SINGLE - BULK PACK 20 UNITS******Bulk Pack comes with 20 sing.. 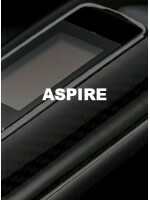 Aspire Athos 4mL TankIntroducing the Athos tank from Aspire! The Athos tank is a new heavy hitter fo.. Aspire Breeze Charging DockCharging dock for the Aspire Breeze Kit.Capacity: 2000mAhOutput Specs: 5V.. Aspire Breeze 5pk CoilsReplacement Coils compatible with both the Aspire Breeze and Breeze 2 Ki.. Aspire Breeze KitIntroducing the all new Aspire Breeze. The Breeze is our latest all-in-one device t.. Aspire Cleito EXO Coils With its fully interchangeable coils with the Cleito tank just adds mor.. Aspire Cleito 120 Tank Replacement Glass 4ML 1 x Cleito 120 Replacement Glass Tube 4ML..